Tandem Chillers Inc. manufactures water to water heat pumps and water source heat pumps. 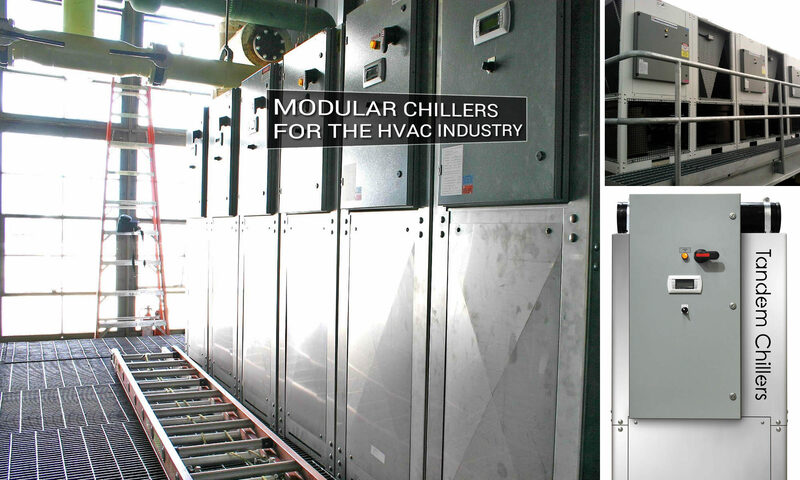 Since designing our first modular chiller over ten years ago, we’ve brought our vast knowledge gained over 40 years of process chiller design to the design of our heat pumps for alternative sources of cooling. Our heat pumps are of sound refrigeration design and easily serviced. Best of all, our heat pumps are designed in such a way that they can be removed for service without shutting down the rest of the system. Today we have the widest selection of heat pump chillers, high efficiency chillers using a variety of Freons and it is expanding each year. Heat pumps are very much like a typical chiller with the addition of a four-way reversing valve in the refrigeration circuit. In the summer months the chiller operates as a standard water cooled or air cooled chiller providing chilled water for the building. During the winter months the water to water chillers operation is reversed and the condenser becomes the evaporator cooling the tower water or fluid cooler water/glycol while the evaporator now acting as the condenser is providing hot water for the building heating. During the winter months the air cooled chillers operation is reversed and the condenser becomes the evaporator cooling the outside air while the evaporator now acting as a condenser is providing hot water for the building heating. These type of heat pump chillers use a “three pipe system”, with one set of water pipes for the summer condenser water/winter evaporator cooling supply water, on set of water pipes for the summer cooling water and the third set of pipes for the winter heating water. With three sets of water pipes there is no need for motorized valves to change over water lines from cooling to heat.